"Great Lakes Brewing Company has been named the Official Craft Beer of the Cleveland Indians. Ohio’s original craft brewery, known for its award-winning portfolio, will feature core brands like Dortmunder Gold Lager, Holy Moses White Ale, Great Lakes IPA and rotating seasonal/pub exclusives at the ballpark all season long. The long-term partnership between the Indians and Great Lakes Brewing brings together two hometown organizations that value community engagement and a focus on sustainability." Cleveland Indians baseball has been a part of our story for decades. As Cleveland's original craft brewery located less than two miles from Progressive Field, we have a large family of employees who are passionate Tribe fans. Since 1988 our brewpub has been a popular destination for home team and visiting baseball fans before and after games, with our sustainable Fatty Wagon shuttle transporting guests to and from the stadium. 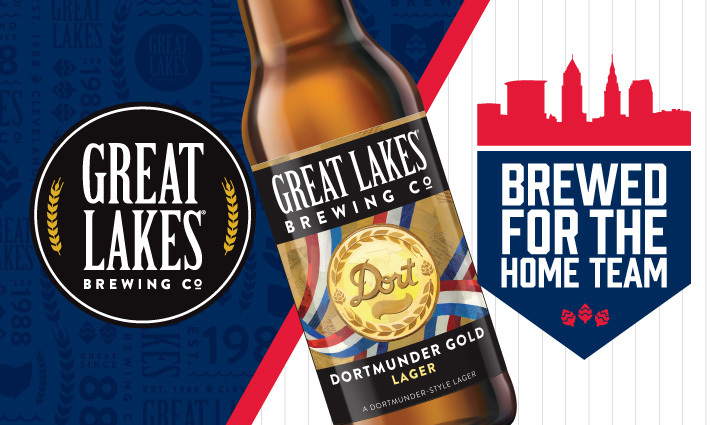 Dortmunder Gold Lager first became available in the stadium’s Terrace Club in 1994, and since then our presence at Progressive Field has grown. Our beer is now available in bottles, cans, and on tap in several locations throughout the stadium, including our stand in the Right Field District, Great Lakes Brewing Co. Beer Garden, draft cart, and at the Corner Bar. During the 2019 season fans can once again look forward to a wide variety of fresh Great Lakes Brewing Co. beer at Progressive Field including year-rounds like Dortmunder Gold Lager, Holy Moses White Ale, and new Great Lakes IPA, and rotating seasonals like new Buckin' Mule Moscow Mule Ale and Lake Erie Monster Imperial IPA. GLBC brewpub’s signature beer brats and barley pretzels with Bertman’s Dortmunder Gold Lager Mustard are available in the Right Field District. Throughout the season fans will see Great Lakes Brewing Co. signage and promotional items featuring Cleveland Indians logos both within the stadium and in the market throughout the Cleveland Indians' broadcast footprint. Our official partnership with the Cleveland Indians will help us create even more traditions and memories with our shared fans and guests. We are excited for another fantastic season of Cleveland Indians baseball, and are proud to brew for the home team! When you make GLBC beer your beverage of choice on game day, share your pictures with us on Facebook, Twitter, and Instagram. And don’t forget to join us for our Home Opener celebration at the brewpub on April 1.